Perfect pool weather! Or beach weather! Alas, we’re not getting wet. In fact, when J was offered the opportunity to go swimming with a friend today, she refused out of pure sisterly loyalty. 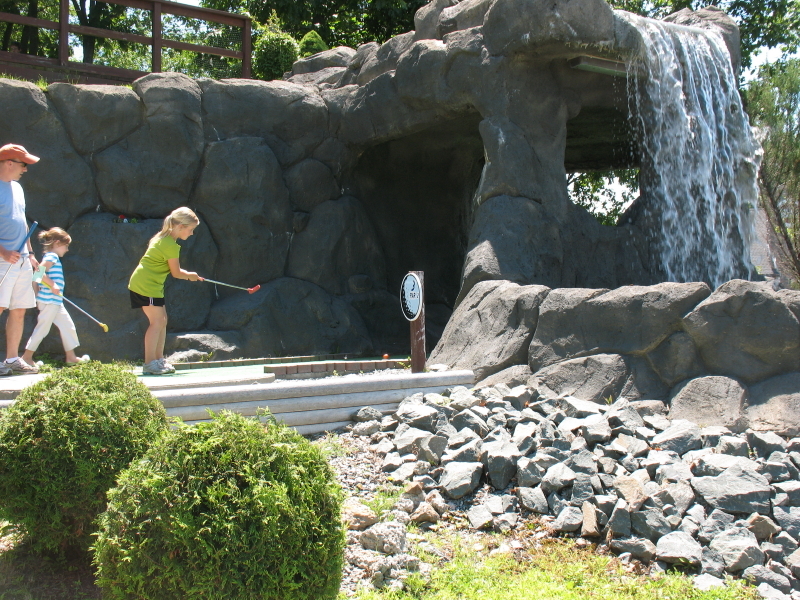 So in our search for dry-but-fun outdoor activities, an obvious one was mini-golf. For the 4th of July, we decided to go with a new destination (we’ve been to the Control Tower and Glenville Sportsplex) and have lunch and ice cream. We tried Oasis Family Fun Park in Troy. We started out with a lunch of champions, including cheeseburgers, hot dogs, chicken fingers, and fries. There was a bargain deal including pizza, but the pizza didn’t look great. The cheeseburgers and hot dogs were pretty tasty. We ate in the Clubhouse, but if I were to do it again, I’d carry the food out to some picnic tables behind the Clubhouse in the shade. And if you’re wondering if you can bring your own picnic, the answer is no. Cute W and I basically felt sick to our stomachs for the rest of the day, but I don’t think that it’s a particular reflection on their food–we’re just usually better eaters than that. Oh, yeah: except we also all had chocolate chip waffles for breakfast, too. Okay, okay. . . it was not exactly a Jamie Oliver-approved day of eating. Perhaps there was excessive pity-indulgence going on. In my defense, I’d like to offer that today the girls had spinach smoothies for breakfast and about 3 cups-worth of carrots and snap peas while watching tv. What, your children were chomping on vegetables while playing boisterously and imaginatively outdoors? Okay, you win. But it is very difficult to pass the time on a sunny day in the 80s without involving water. Sorry–I’m whining. And I’m off-track. Anyway. 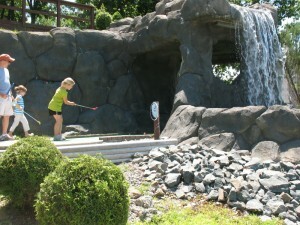 . .
Mini-golfing was fun. It cost $6.50 per grown-up (13+) and $4.50 per kid. I particularly appreciated the holes that were shady and the occasional blowing droplets from the waterfall. Especially since I’m used to the unbelievably sweltering Control Tower. Frequently I feel like mini-golf courses seem squashed into a tiny place, but this felt pretty spacious. At a favorite hole, we hit the balls into a stream, and they were carried through the water, over a grate, and onto the next green. Oasis also has laser tag, a bouncy-bounce thing called the “Defender Dome” (which was closed when we were there) and a paddle boat activity. 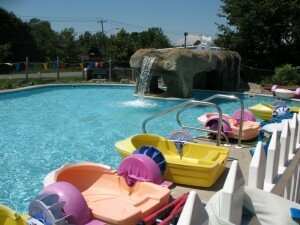 Actually, I chuckled at the paddle boat area when I first arrived, because it really looked basically like a glorified pool. 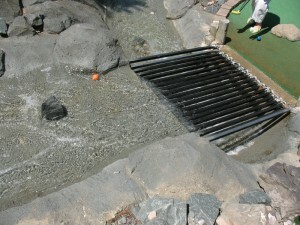 But after the mini-golfing, we watched folks happily paddling and splashing around. You can go under the waterfall to get completely wet if you’d like. We finished off the outing with some ice cream. 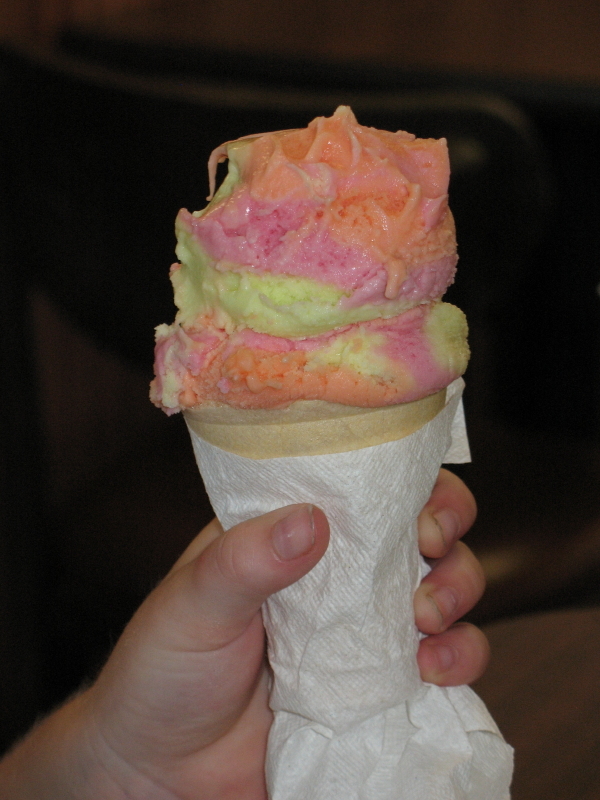 The staff were friendly and quite patient with the girls as they pondered flavor choices. They have hard (Perry’s) & soft ice cream, frozen yogurt, and smoothies. Oh, and yes: they do birthday parties, as well as season passes.